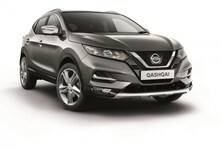 Nissan recently introduced a host of Intelligent Mobility active safety technologies in its Qashqai, X-Trail and Patrol ranges. Nissan Intelligent Mobility helps drivers to monitor their vehicles and their surroundings, anticipate unpredictable situations, and protect themselves as well as their passengers. For Nissan, intelligent driving is foremost about performance, comfort and safety, removing the stress from a daily commute or minimising the risk of unsafe conditions. In its commitment to what it terms 'real-world safety', Nissan pursues innovation as part of its Safety Shield concept. Based on the idea that cars should help protect people, the Japanese brand's advanced, proactive Safety Shield technologies, as detailed in this article, help drivers and passengers to avoid danger and lays the platform for the introduction of more autonomous drive technologies in future products. If there is a vehicle in your blind spot, the radar-operated Intelligent Blind Spot Warning system will warn you by using a warning light in the front inside corner of the driver’s or front passenger’s door to let you know on which side the hazard is. If you indicate that you are about to execute a lane-changing manoeuvre, but there is a vehicle in your blind spot, a warning light will flash and an audible signal will sound. If you (the driver) don't heed the warning, the Intelligent Blind Spot Intervention will help you bring the vehicle back toward the centre of the lane in which it's travelling by automatically applying braking to the opposite side of the vehicle. 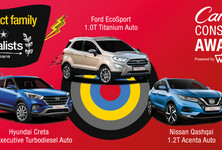 Tekna-specification Qashqai and X-Trail derivatives, as well as the Patrol luxury off-roader, are equipped with these technologies. This system keeps an eye on your car's speed/proximity to the vehicle ahead of you and will warn you if you need to slow down. It can also apply braking if you fail to respond to the warning to help avoid a collision. On the Patrol luxury off-roader, the system underpins Intelligent Cruise Control, which is a boon on long trips: a touch of a button activates the cruise control and allows you to set the desired cruising speed. Using radar to maintain a set speed and distance between you and the vehicle in front of you, it dynamically applies braking to maintain safe following distances. When you start to drift from your lane, the camera-based Intelligent Lane Intervention system alerts you with a visual warning on the display and an audible signal. If you ignore the warning and Intelligent Lane Intervention detects that your vehicle is still straying from its lane, it will apply braking to gently guide you back between the freeway road markings and out of harm's way. This system features on the X-Trail 2.5 Tekna 4WD CVT and 1.6 dCi Tekna 4WD. In the Patrol 5.6 V8 LE 4WD 7AT, it is known as the Intelligent Lane Departure Warning and Prevention system. If the driver does not adequately respond to the risk of a collision, this function will automatically engage the vehicle's brakes. In case the relative velocity is less than 60 kph, it may be possible to avoid a collision. If the collision cannot be avoided, the system will apply the brakes to help mitigate the collision and help reduce the likelihood of injury. 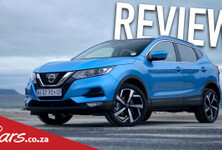 To put it another way, a Tekna-specification Qashqai or X-Trail, which are equipped with the pair of interlinked technologies, effectively scans the road ahead and warns you to slow down, before you can even see what’s stopping traffic. 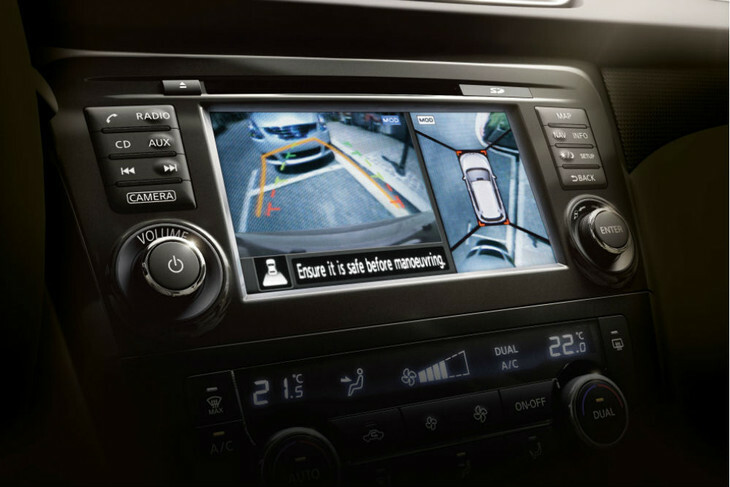 Intelligent Around View Monitor, which features in Tekna-specification Qashqai and X-Trail derivatives, as well as the Patrol luxury off-roader, brings the areas surrounding parking spaces in full perspective so that you can manoeuvre the vehicle safely and with confidence. The system uses four cameras to produce a virtual composite 360 bird’s-eye view of the vehicle, with selectable split-screen close-ups of the front, rear, and kerbside views. The associated Moving Object Detection feature, in turn, can detect moving objects near the vehicle and give you visual and audible alerts.